Kaoka, the brainchild of Henry Wood Booth, came about after a doctor suggested that he quit drinking caffeine and gave Booth a recipe for “bran coffee.” Since Booth and his children all liked the beverage, he determined one night that it might make a good business venture. He experimented with various roasting pans– even one in the form of a coffee roaster which was a failure as “it nearly blew up with the generated steam.” Booth finally made one that roasted to his satisfaction and the family gathered together to name this new beverage and “Kaoka” was born. Wrappers were printed and family members made paper boxes to put in local grocery stores. The Kaoka Manufacturing Company, 1879. Henry Wood Booth Papers. 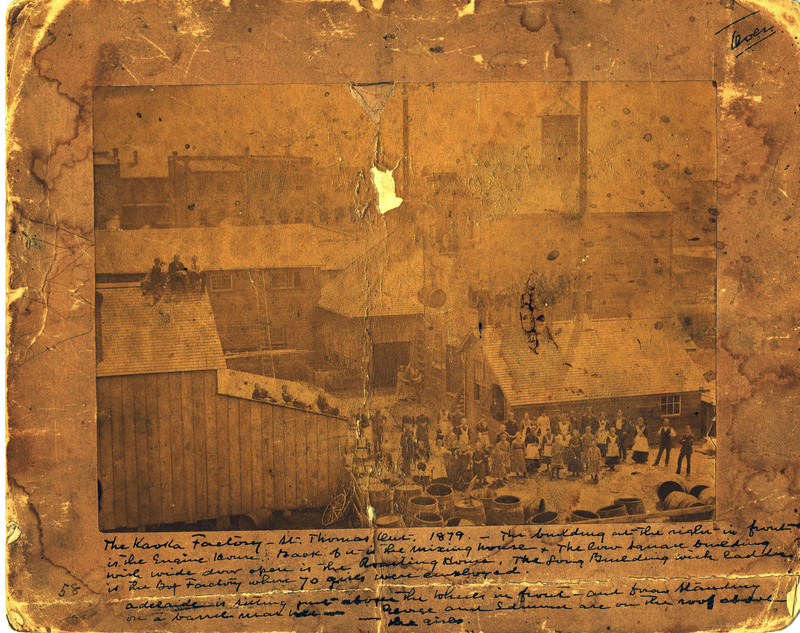 In 1880, the company’s directors asked Booth to go to Detroit in order to establish the business in the United States. However, Booth made the decision (which he later deemed “unwise”) to strike out on his own and set up the American business for himself, and sold his interest in the Canadian venture. After several set-backs, and his money ran out, Henry Wood Booth got out of the Kaoka business and went to work for the United States Post Office. The Detroit venture was, however, what ultimately relocated the Booth family to Detroit. And, Henry Wood Booth was considered the originator of the commercial cereal beverage. Sidebar: during the time the company was trying to set up the Detroit enterprise, two men who had worked at the Kaoka plant in St. Thomas went to Battle Creek and established the cereal drink under a new name! For many of us who grew up in Michigan, going up north during summer vacation was (and still is) something very special – a way to escape the hustle and bustle of city and suburban life and become one with the natural beauty it has to offer. Throughout the 20th century, Cranbrook scientists, artists, architects, students and faculty, as well as members of the Booth family, took advantage of the native woods, white sandy beaches, and waters of Lake Michigan. 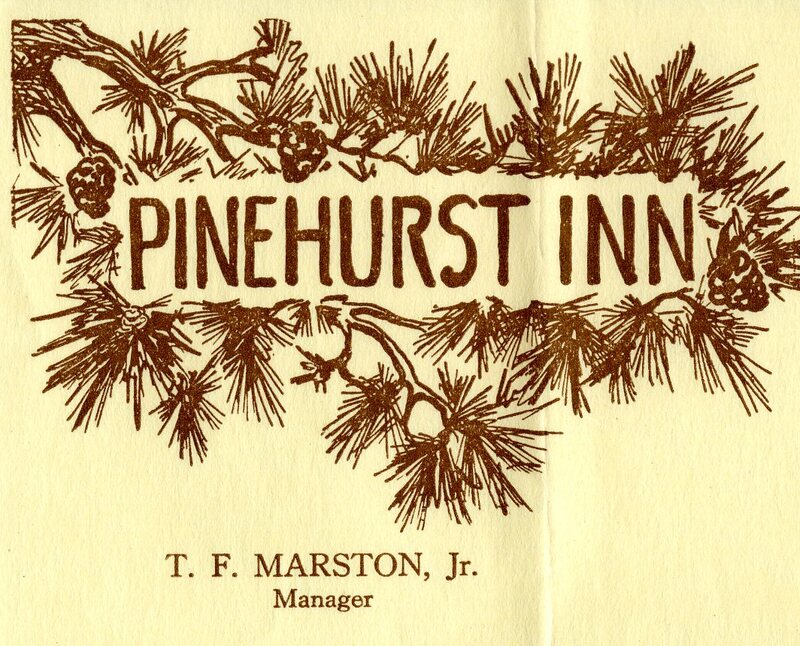 Logo for Pinehurst Inn, Indian River, 1940. Cranbrook Archives. Shelley Selim, Cranbrook Art Museum’s Ralph and Jeanne Graham Assistant Curator, curated the exhibition Designing Summer: Objects of Escape which features Michigan designers and companies who have contributed to summer innovations including tents, boats, and bicycles as well as a summer home designed by Florence Schust Knoll. In response to the opening of the exhibition on Saturday, June 20th, I opted to post a few highlights of Cranbrook’s ongoing relationship with northern Michigan. 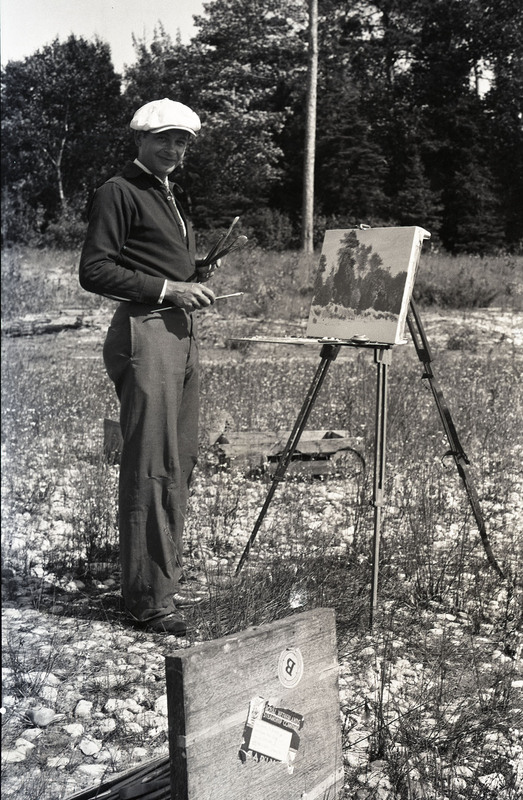 Dudley Blakely painting at group site, Bois Blanc Island, 1938. Cranbrook Archives. As early as 1929, staff and faculty from the Institute of Science traveled north to conduct studies of animal and plant life on the many islands in Lake Michigan – from Bois Blanc to the Manitous. Reports of these research trips were documented in photographs, field notes, and ultimately published in Institute of Science newsletters and bulletins. During the 1940s and 1950s, Henry Scripps Booth took his family up north for several summers, often vacationing with friends. One of their favorite spots was Good Hart, where they stayed either at The Krude Kraft Lodge or the Old Trail Inn. 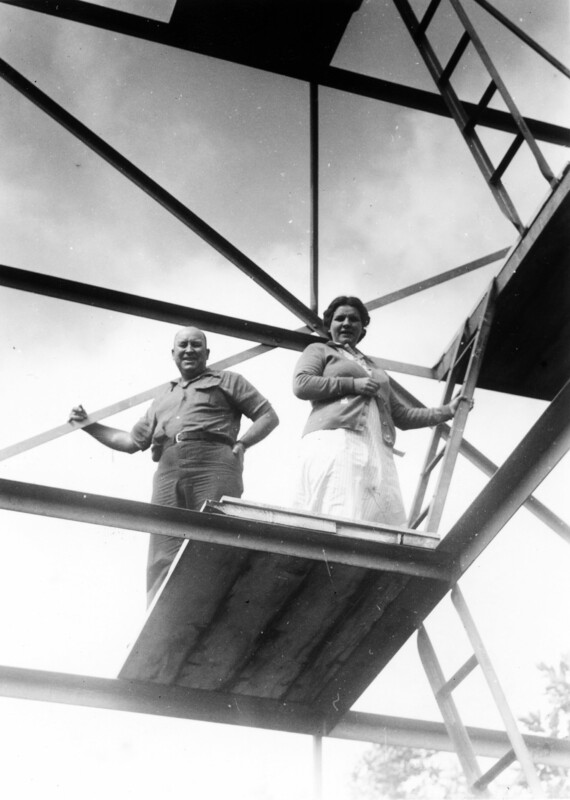 Carolyn Farr Booth and Chauncy Bliss on the Fire Tower at Good Hart, ca 1940. Cranbrook Archives. Communities like Cross Village, Harbor Springs, and Glen Arbor have been inspirational for Cranbrook artists and architects for centuries. Former head of architecture, Robert Snyder, designed an A-Frame beach cottage for Wally Mitchell, while architecture student Harry Weese designed a trifecta of summer homes (two for the Weese family) at Glen Arbor. “Shack Tamarack” (named after the tamarack logs used in its construction) was built in 1936 and is still used by Weese descendants today. Harry followed that with “Cottage Two” in 1939, a one story house designed with his brother John, and the Pritchard House which spoke to the modern aesthetic Weese experienced as an architecture student at Cranbrook Academy of Art. Robert F. Swanson and Pipsan Saarinen Swanson spent decades designing commissions up north including the ultra-modern MacDonald Building in Harbor Springs, the L’Arbre Croche Condominium development, and the family’s own summer cottage at Menonaqua (along with son, Bob). Check out Shelley’s blog about Pipsan’s Sol Air furniture which is featured in the Designing Summer exhibition. While architect Tod Williams (Cranbrook School ‘61) served as project manager for Richard Meier’s Douglas House project also located in Harbor Springs, other Cranbrook-related projects up north include The Munising Design Strategy Matrix – a community design project managed by The Community Design Advisory Program (CDAP). Established in 1987 by Design Michigan, a non-profit, state outreach program housed at Cranbrook Academy of Art, CDAP provided tailored community design and revitalization services to the city of Munising. And, in 2013, Peter Pless (CAA ‘02) lead a design collaboration between the Human Centered Design Program at Northern Michigan University and the Lloyd Flanders furniture company of Menominee, Michigan. Thankfully, there is seemingly no end in sight to the inspiration and possibilities of art, architecture, science, and plain old fashioned relaxation one can find up north. 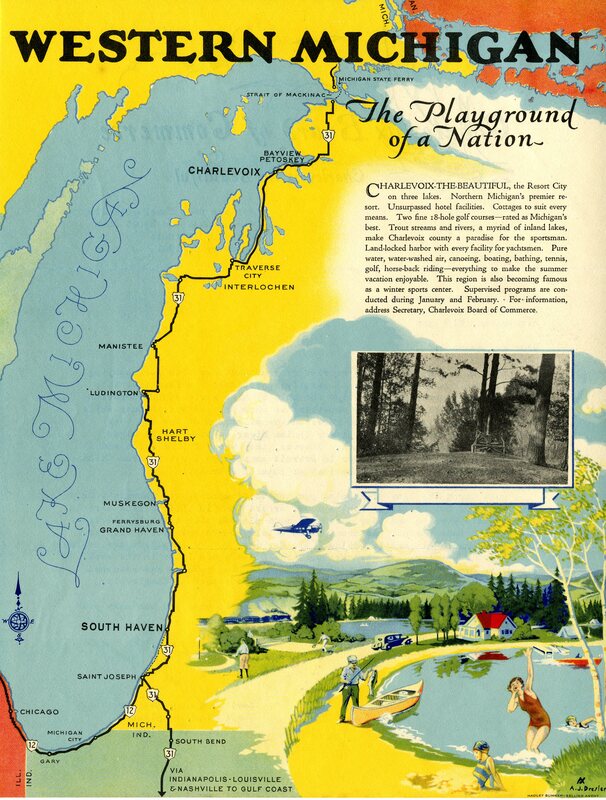 Promotional Literature, Charlevoix Chamber of Commerce, 1941. Cranbrook Archives. Mention Lake Jonah to anyone who has been around Cranbrook since 1999, and the response will be immediate – bittersweet. Fond memories mixed with sadness that it is not used as a swimming hole any longer. Originally referred to as the “Milles Fountain Lake,” the man-made lake is also known as Jonah Lake or Jonah Pool. 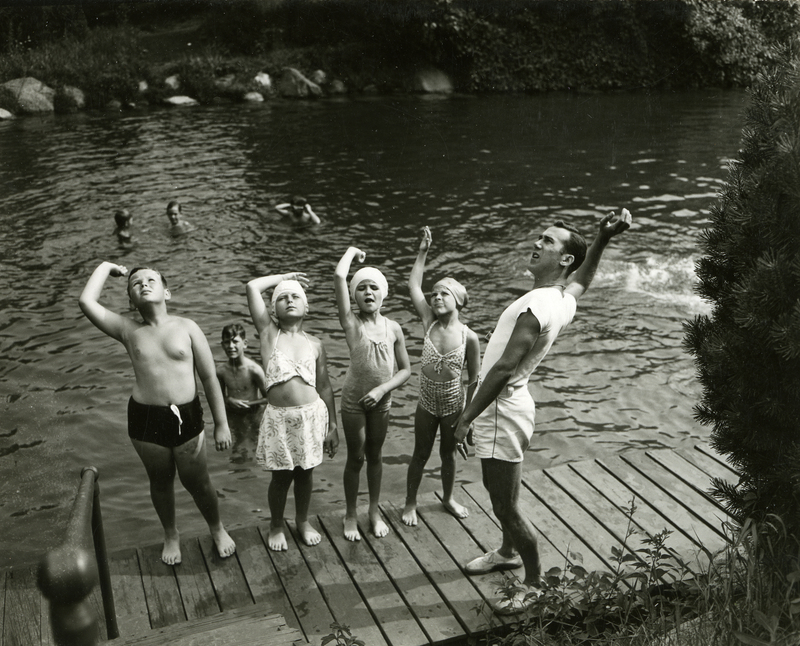 Funded by George Booth as a place for community members to swim during the summer months, Lake Jonah, built in 1933, became a gathering place – for Trustees and Directors and their families, Academy of Art students and faculty, Summer Theatre and Summer Institute campers, Horizons-Upward Bound students, and hundreds of Cranbrook-Kingswood day and boarding school students, who all loved to hang out in the natural setting. George Booth originally intended for the lake to be a water feature at the end of Academy Way, but quickly realized that people would swim in it anyway, so he turned it into a swimming pool. 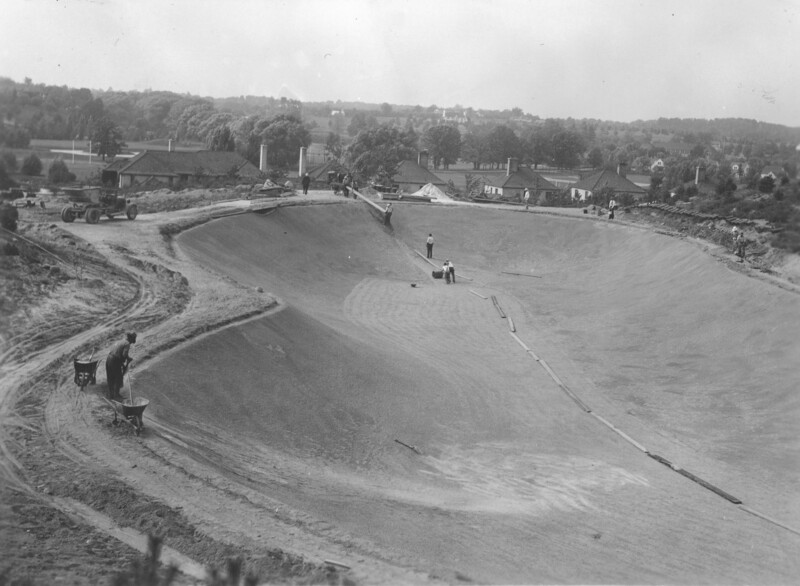 When the water was first turned on, a large amount of seepage was discovered so waterproofing of the pool bottom began in July 1934. Lining the bottom of Lake Jonah, Sep 1934. Richard G. Askew, photographer. The cost of construction was just over $34,000. This included the liner, the drain, paving, and landscaping around the pool, designed by Detroit landscape architect, Edward Eichstaedt. The pools covered 54,375 square feet (or 1.248 acres) and held 3,082,830 gallons of water. Swimming lessons, Summer Institute, Jul 1946. Harvey Croze, photographer. Initially overseen by the Cranbrook Central Committee (a department of the Cranbrook Foundation), Lake Jonah gradually became too expensive and too risky for Cranbrook Educational Community to maintain. Swimmers snuck onto campus at all hours and swam in the pools without lifeguard supervision. After the summer of 1999, the decision was made to close Lake Jonah for swimming and thus ended decades of summer memories. While working in our digital database recently, I came across an image of something called Chanticleer Cottage. The unusual name and image piqued my interest. Chanticleer Cottage started out as the “Chicken House,” built in 1945 on the site of the old toboggan slide at Cranbrook School. 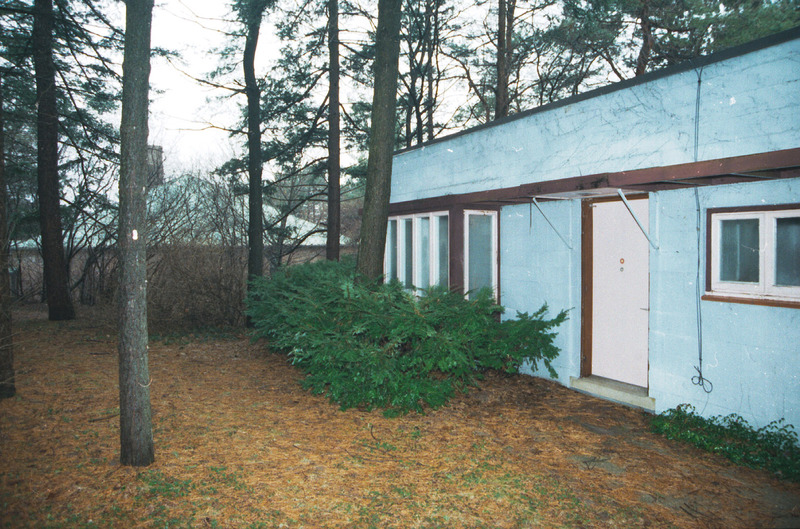 It was also known as the “Biological Lab,” “Experimental Building,” and “Animal House.” The structure was built to house chickens that accompanied Holland Sperry, the new head of Cranbrook School’s science department. The cost of the 20 x 30 foot building was just under $10,000. Sperry used the chickens to study genetics, and students in the science department completed experiments and conducted research on animals. 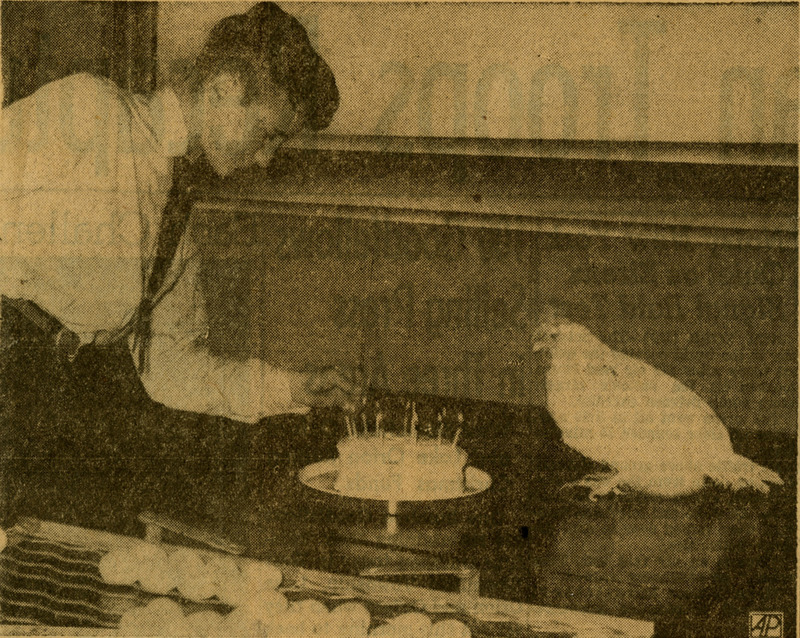 The most famous resident of the “Chicken House” was Esmerelda, a single-comb White Leghorn who celebrated her 12th birthday (100 in human years) with a cake and candles. Sperry retired in 1957. In 1958 the building was remodeled into a three bedroom house, at a recommended cost of $25,000 and turned into faculty housing. It was given the more elegant name of Chanticleer Cottage. The building was demolished in 1998 to make way for the Natatorium. The portrait of Clara Gagnier Booth, mother of Cranbrook founder George Gough Booth, has been mounted in the Oak Room at Cranbrook House. This painting is on long-term loan to Cranbrook from the Saginaw Art Museum, which acquired the painting through a donation from Clara Booth’s grandson, John Lord Booth I. Conservation in-progress, April 2013 by Kenneth B. Katz, Conservation and Museum Services. After receiving conservation treatment and a new frame, this painting of Clara Booth will accompany that of her husband, Henry Wood Booth, as well as their son George, his wife Ellen Scripps Booth, and Ellen’s father James Edmund Scripps. Financial support from John Lord Booth II affords this opportunity to join the painting of the Booth family matriarch with those of her relatives at Cranbrook House. The artwork was painted in 1918 by Russian-born artist Ossip Perelma, known particularly for his portraits of men of stature such as President Woodrow Wilson, King Albert I of Belgium, and several Russian and French political officials. Perelma also executed the stately portrait of Henry Wood Booth, currently on view in the Oak Room. Demure in size and executed with soft and fluid brush strokes, Clara Booth’s portrait contrasts with that of her husband. While Henry is depicted in full length in an outdoor background, his wife is shown only by profile, with just the upper half of her torso included in the composition. The stylistic distinction between Clara’s portrait and that of her husband—and indeed many of Perelma’s other subjects—emphasizes the differing approach Perelma took to depicting a woman. In the early twentieth century, even women of position, beauty, and culture were often removed from public view after their role as wife and mother was fulfilled, and their youth had faded. This portrait was painted when Clara Booth was 79, and it is notable that Perelma chose not to conceal his subject’s age. Indeed, the portrait is a rare and significant example of art providing legitimacy and prestige to a woman who remained elegant and strong as she reached an age when most women no longer had a public presence or were being immortalized by artists. Both portraits, Clara Gagnier Booth and Henry Wood Booth, will be available for viewing when Cranbrook House opens for public tours on Sunday June 14th! For more information on the tours check out the Cranbrook House & Gardens Auxillary website.